A man identified as convicted Russian spy Evgeny Buryakov is pictured on a commercial flight during his repatriation into the custody of Russian authorities in a photo released on April 5, 2017. Evgeny Buryakov, a Russian spy who posed as a New York banker, was deported from the United States on Wednesday in accordance with the conditions of his early release from federal prison over the weekend. According to U.S. Immigration and Customs Enforcement, Buryakov, 42, was escorted onto a commercial flight by Cleveland-based law enforcement officials and "turned over to Russian authorities." Court documents filed by the U.S. Department of Justice describe how Buryakov operated under "non-official cover" as a high-ranking employee in the Manhattan office of the Russian-owned Vnesheconombank (VEB) while he passed information to Igor Sporyshev and Victor Podobnyy, two Russian Foreign Intelligence Service (SVR) agents tasked with gathering "economic intelligence" about the United States. 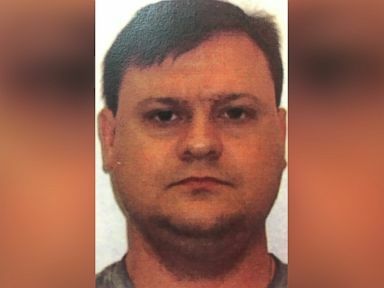 Evgeny Buyakov, seen in an ID photo obtained by ABC News, was arrested in early 2015 and faced criminal conspiracy charges related to spying. In 2013, Podobnyy attempted to recruit Carter Page, who later served as a foreign policy adviser to Donald Trump's presidential campaign, as an intelligence source. Page has acknowledged that he is in fact the "Male-1" identified in a recently unsealed FBI complaint, which describes the group's attempts to draw Page into their information-gathering operation. "You promise a favor for a favor," Podobnyy said. "You get the documents from him and tell him to go [expletive] himself." Page, who cooperated with the FBI's investigation of Buryakov, told ABC News that the group's attempts were unsuccessful, and any information he passed to SVR agents was "immaterial." “Any information I could give is, again, immaterial and all public information,” he said during a break in a New York energy conference on Tuesday. The spy trio, meanwhile, had no idea that they were being watched -- physically and electronically -- by the FBI while they shared information, attempted to recruit sources and engaged in tradecraft designed to throw investigators off their scent. The FBI complaint lays out their attempts at espionage in detail -- the cryptic phone calls, the hastily arranged meetings, and even their gripes that their jobs weren't as exciting as "movies about James Bond" had led them to believe. "Of course, I wouldn't fly helicopters, but pretend to be someone else at a minimum," Podobnyy told Sporyshev, who commiserates: "I also thought that at least I would go abroad with a different passport." Buryakov was arrested on January 26, 2015, and charged of "conspiracy to act in the United States as an agent of a foreign government. He pled guilty as part of a plea agreement and received a 30-month prison sentence and a $100,000 fine. Sporyshev and Podobnyy, however, fled the country and returned to Russia before they could be arrested. Former U.S. Attorney Preet Bharara, whose office handled the case, said the case serves as a reminder that foreign agents with questionable intentions still seek to operate on U.S. soil. "More than two decades after the end of the Cold War, Russian spies still seek to operate in our midst under the cover of secrecy," said Bharara in 2016. "But in New York, thanks to the work of the FBI and the prosecutors in my office, attempts to conduct unlawful espionage will not be overlooked. They will be investigated and prosecuted."